Monica was born in Africa, near Carthage. She was born to a Christian family and grew up within the bounds of the Church. However, when she was older her parents agreed to marry her to an older non-Christian man by the name of Patricius. Patricius was known to be an abusive man with a volatile temper. However, Monica continued to attend church services nearly every day and prayed for her husband with an undeniable fervor. Her love and devotion to a man who she hadn't chosen or known had a marked influence on Patricius. Though he did not convert until the end of his life, he never beat her or physically abused her. Over time, his verbal abuse stopped as he realized that it was having no effect on her or her love for him. They had three children--the eldest of which was named Augustine. To say that Augustine was the apple of his mother's eye is quite the understatement. Through his writing we learn much of Monica's fabled devotion and love for those near her. 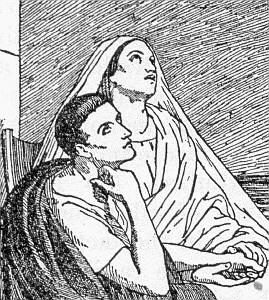 Augustine was not a Christian and, as a youth, seemed to show no interest in his mother's faith. She prayed for him daily in spite of his mockery and derision. When he joined the Manichean cult, she prayed for him and sought direction from spiritual leaders and mentors. She received a vision in which an angel told her: "Your son is with you. "She joyfully told Augustine about her vision and he dismissed it. He insisted, cruelly, that this could tell of her own apostasy as easily as it could tell of his conversion. Overlooking her son's cruelty and mockery, she responded: "No, the angel didn't say I was with you. The angel said you were with me." Monica shed many tears for her prodigal son who seemed to flee his mother and avoid her prayers. She continued to pray for him at every opportunity. Eventually, a bishop she had been talking to told her, "Go now, please...It is not possible that the child of so many prayerful tears should be unaffected." The bishop was right but Monica would not know this for many more long prayer-filled days. After her husband had converted and died, she went to live with Augustine in Italy and eventually, and partially through her own engineering, he began conversing with St. Ambrose the bishop of Milan. It was there--in Milan--that Augustine finally converted and Monica's hopes and dreams for her son were realized. Her prodigal son had come home and she ran to meet him at the gates. He was baptized, much to her joy, in 387. They enjoyed a scant few worship experiences together before Monica's death at the age of fifty-five. 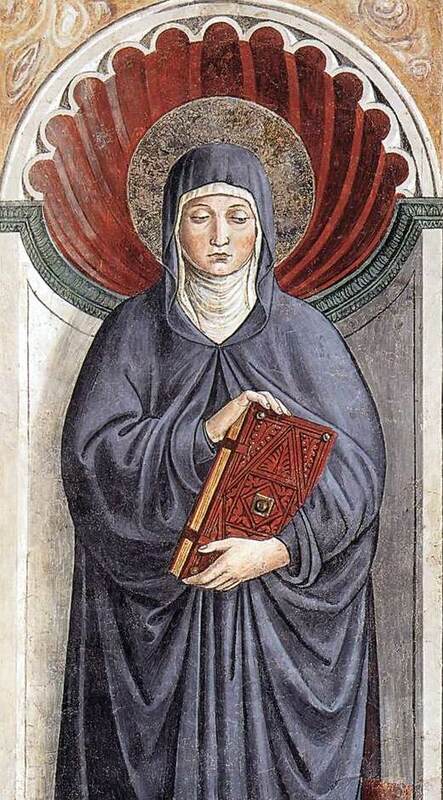 She told Augustine, prior to her death, "There was only one reason that I wished to remain longer in this world: to see you profess the Christian faith before I died. I have seen this, what else is left for me?" As she died, someone asked her, "Aren't you afraid to die so far from your home?" They expected that Monica wanted to die near Carthage. 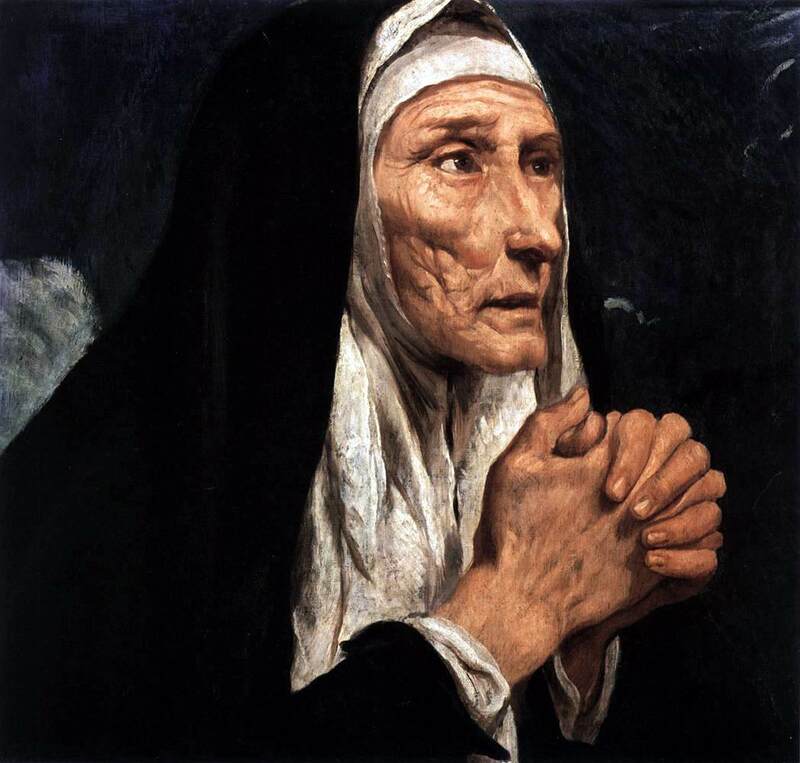 However, Monica responded with the wisdom and spirituality that had sustained her through many prayer and tear filled nights:"Nothing is far from God."